The Handbook of Research Methods in Early Childhood Education brings together in one source research techniques that researchers can use to collect data for studies that contribute to the knowledge in early childhood education. To conduct valid and reliable studies, researchers need to be knowledgeable about numerous research methodologies. The Handbook primarily addresses the researchers, scholars, and graduate or advanced undergraduate students who are preparing to conduct research in early childhood education. It provides them with the intellectual resources that will help them join the cadre of early childhood education researchers and scholars. The purpose of the Handbook is to prepare and guide researchers to achieve a high level of competence and sophistication, to avoid past mistakes, and to benefit from the best researchers in the field. This Handbook is also useful to university professors who conduct research and prepare student researchers in early childhood education. It aims to improve the researchers' conceptual and methodological abilities in early childhood education. 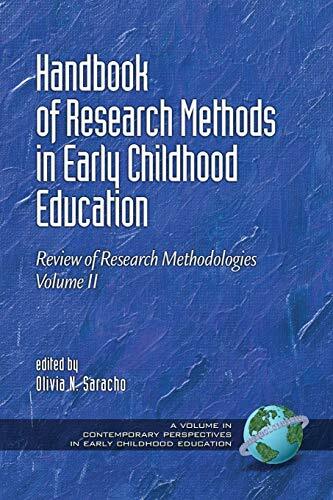 Thus, the Handbook can be used as a guide that focuses on important contemporary research methodologies in early childhood education and describes them to offer researchers the necessary information to use these methodologies appropriately. This Handbook is designed to be used by students of early childhood education at all levels of professional development as well as mature scholars who want to conduct research in areas needing more in-depth study. It is hoped that this Handbook of Research Methods in Early Childhood Education will serve the needs of many in the research community. Scholars seeking the current state of research knowledge in various areas should find this volume useful. Similarly, practitioners who are trying to seek knowledge of research and its practical implications should find this volume helpful as well. This Handbook with its individual chapters presents several research methodologies to address a variety of hypotheses or research questions that will contribute to the knowledge of the field in early childhood education.